At E3 2013, I got to play a demo of Dragon Fantasy: Book II while chatting with Adam Rippon, the creative director at Muteki Corporation. For someone I had just met, it was surprising how Adam seemed to be someone I had known my whole life. To put it simply, we both grew up playing the exact same games, and if we were to write up lists of our favorite games from our childhoods, they would include a very similar or nearly identical list of titles. Dragon Fantasy: Book II was clearly inspired by those games we grew up with, such as 16-bit classics like Final Fantasy IV, Final Fantasy VI, Chrono Trigger and Secret of Mana, and so I left E3 looking forward to the game’s release. To hold me over in the meantime, I decided to play through Dragon Fantasy: Book I, which was inspired not only by the 16-bit games mentioned above, but the older 8-bit games of my childhood, such as the early Dragon Quest games. Despite the greatness of the games it tries to parody, Dragon Fantasy: Book I isn’t a great game by any stretch of the imagination, but it does provide some amusing moments throughout and plenty of nostalgia inducing imagery and writing that I couldn’t help but enjoy regardless of the overall quality of the game. Dragon Fantasy: Book I is similar to Dragon Quest IV in that the game is divided into several chapters, each starting a different character or group of characters. 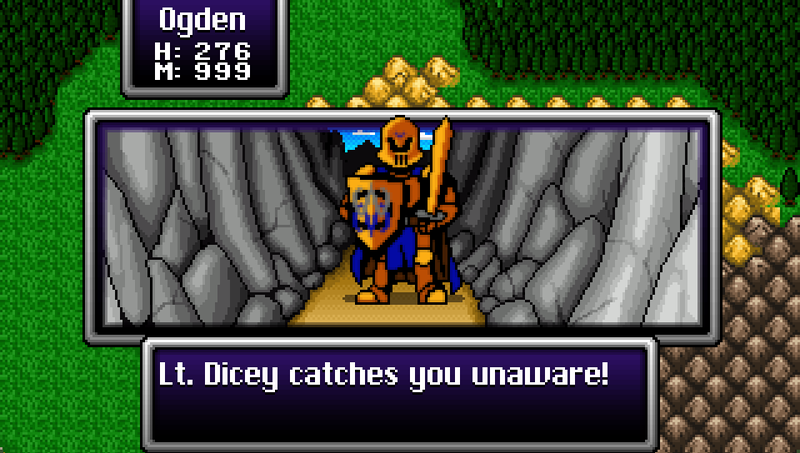 Just like in Dragon Quest IV, the first chapter is about a soldier protecting his kingdom who travels alone, though the bald hero, Ogden, seems nothing like DQIV’s Ragnar McRyan at first glance. Likewise, Chapter 2 is about a Prince named Anders, and I can’t help but to wonder if the reason for the decision to make a prince playable in this chapter was to make us remember Princess Alena, also from Chapter 2 of DQIV. The third and final chapter centers on Jerald, a thief, and his niece, Ramona. Though they are nothing like the merchant Torneko (Taloon) and his wife from Chapter 3 of DQIV, they share a similar objective. Jerald and Ramona need to raise 20,000 coins in order escape a desert empire, which is reminiscent of the fundraising Torneko had to do to buy his own store. I imagine if Dragon Fantasy: Book I had had two more chapters, the 5th would have culminated with the gathering of all of the characters from the previous chapters and they all would have gone on a grand adventure, but—unlike Dragon Quest IV—this game ends rather abruptly at the end of chapter 3. It’s kind of like sitting down to dinner expecting a three course meal, but only being served a rather bland appetizer. The characters themselves have a bit of potential to grow into more interesting people, but within the scope of this game, we barely get to know them. Perhaps Book II will deliver on that potential, but as a self-contained product, Book I doesn’t include enough substance to create any sort of attachment with the characters or the overall storyline. 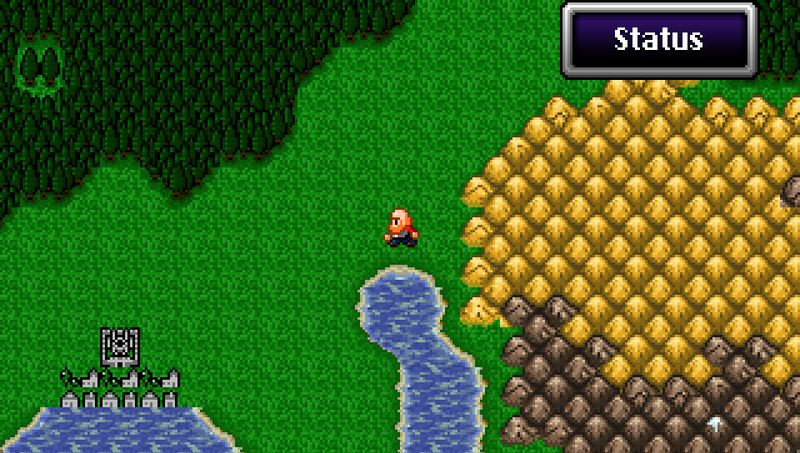 However, Dragon Fantasy: Book I does succeed in its attempt to look, feel and play like a classic Dragon Quest game. The cities, castles and the world itself are made up of tiles representing everything from walls and wells to mountains and rivers. It may not look amazing, but it certainly represents the 8-bit RPG style perfectly. The music also feels appropriate for an 8-bit game, though unfortunately, I found most of it to be more irritating than enjoyable (a sharp contrast from the amazing compositions of the Dragon Quest franchise). The sound effects too are exactly what any Dragon Quest fan would expect from the game, such as the spell and ability sound that is like a backwards and more annoying version of the classic Dragon Quest spell sound. But by far the most accurate tribute to Dragon Quest in Dragon Fantasy: Book I is the battle engine. It mirrors the old turn based RPG engine perfectly, and a plethora of little details round out the system. Written descriptions of each attack are displayed at the bottom of the screen during combat, the text speed can be adjusted in the game’s settings menu, and the borders around the text box and status indicators changes color according to the party’s health. Visually, the battle screen is laid out almost exactly like it was in the original Dragon Quest, with the world map still visible behind the battle interface along the borders, and an appropriate background image appearing behind the monster(s). Oh, the nostalgia! The monsters themselves are an interesting assortment, and the descriptions of their attacks and skills are one of the redeeming qualities of Dragon Fantasy: Book I. 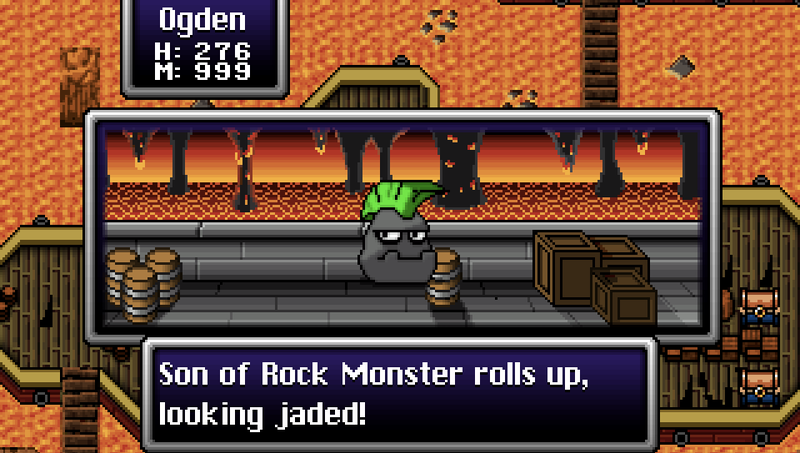 Like the slimes of Dragon Quest, Dragon Fantasy has a family of monsters called rocks. There’s Mr. Rock Monster, Mrs. Rock Monster and Son of Rock Monster to name a few. 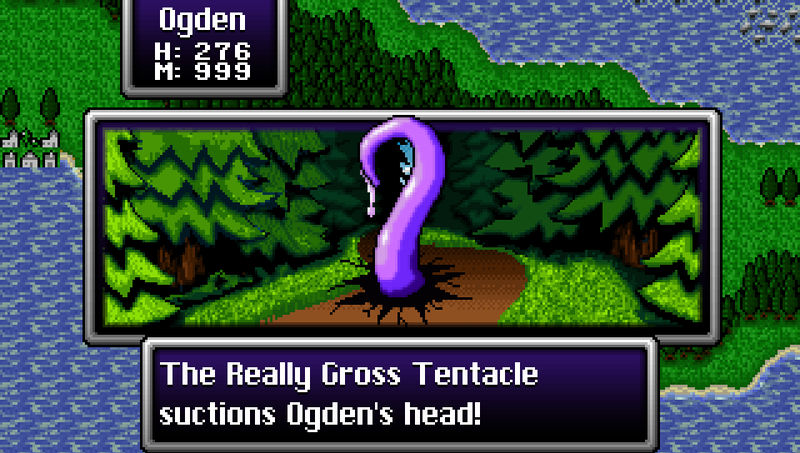 Then there are some monsters that seem more inspired by Earthbound than Dragon Quest, such as Really Gross Tentacle, Hunka Burnin’ Love, and Deadly, Deadly Birds. Finally, there are the pop culture inspired monsters. I cracked up when I was attacked by Blizter (a wolf), which appeared “in a flash of silver hair,” and attacked me with “a piercing look.” Eventually I defeated it, and the death description was, “Blizter gets bad ratings.” That was worth a chortle at the very least. That sense of humor was really all that kept me playing through until the end of the game. Sadly, Dragon Fantasy: Book I includes all of the problems that are inherently present in old JRPGs. Battles are triggered by random encounters that are infuriatingly frequent, and typically devolve into button mashing basic attacks and healing after battle. With the battles occurring every few steps and lasting only a few seconds, the player ends up hearing the first couple bars of the current map’s music and the battle music over and over again, further compounding the tedious nature of random encounters. It gets worse though, because the maze-like caves and dungeons filled with all of this combat grow in complexity throughout the game, and exploring them becomes a real chore, especially since the storyline and characters do not provide the carrot on a stick necessary to keep the player baited and hooked. Aside from the main three chapters, Dragon Fantasy: Book I also includes an intermission chapter that borrows some of the characters from the main game and places them in a Minecraft world on an adventure to find the hat that belongs to the creator of Minecraft, Notch. In this short journey the player will come across enemies from Minecraft such as spiders, skeletons and Endermen. The player can charm the enemies and add them to the party Pokémon style, though given how short the chapter is, there’s little reason to invest much effort into collecting them. Once an axe is acquired, the player can also tear down walls of coal, iron and gold and craft the materials into items and gear to aid them in their quest to recover the hat. In terms of gameplay, it is probably the most interesting part of the entire game, but it’s too short a chapter to add much real value to the overall package. So at best, Dragon Fantasy: Book I provides an amusing distraction and a dose of nostalgia. It’s not a great game, but it does set the stage for the 16-bit styled sequel, Dragon Fantasy: Book II, which I am still looking forward to. If Adam Rippon and the team at Muteki Corporation can use their talent for accurately recreating the style and systems of classic role playing games and combine it with some great storytelling, well developed characters, a full sized game world and more of their sense of humor, they could create something wonderful. We’ll find out if they managed to do so when Dragon Fantasy: Book II is released on September 10th. Ari purchased and played the PlayStation Vita version of Dragon Fantasy: Book I and completed all three chapters and the intermission chapter in less than 8 hours.